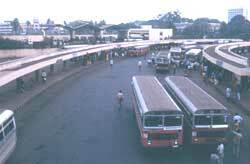 taking its cue from Delhi, the Karnataka government has banned all transport vehicles that are over 15 years old. The state transport department regulation, which came into force from April 1, 2002, forms a part of the authorities' efforts to curb vehicular pollution in the metropolis. Another such measure is a green tax imposed in the form of a compulsory renewal of registration of all vehicles after seven years and 15 years for Rs 250 and Rs 500, respectively. Welcoming the ban, transport commissioner T Thimme Gowda says, "We believe this to be a very progressive step, since everyone knows of Bangalore's high levels of air pollution." But transporters, quite predictably, are up in arms against the move. In fact, the Karnataka Federation of Lorry Owners' Association is heatedly opposing it. "Why impose conditions on the age of the vehicle, when it has already earned an annual 'fitness certificate' issued by the transport department? We will not allow this to go through," says association member Channa Reddy stridently. The union has already held preliminary discussions on the matter with state transport minister Sageer Ahmed, and has extracted an assurance about a meeting very shortly with Karnataka chief minister (cm) S M Krishna. "We will abide by whatever the cm decides," says Gowda. But with 'fitness certificates' known to be an ineffective measure, additional commissioner of police (traffic) M N Reddy is as determined as the lorry owners. "Several hard decisions will have to be made in the days to come," he says and adds, "We are following the example set by New Delhi over its tough stand on vehicular pollution." The problem of vehicular pollution needs to be seen in a wider perspective. Studies carried out by the Central Pollution Control Board (cpcb) and other research bodies reveal that two-wheelers, which constitute nearly two-thirds of the city's vehicles, caused 75 per cent of air pollution in 1998. However, Gowda's contention that only old two-stroke engines are the culprits does not appear plausible. Cosmetic changes will have to make way for an integrated approach to fuel quality , vehicle technology, emission control and traffic regulation if Bangalore has to ride into a pollution-free era.